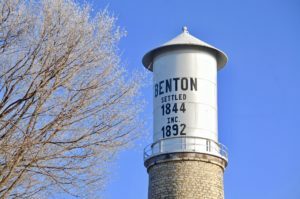 Benton has an elected Village Board consisting of the Village President and a six-member Board of Trustees. The Village Board sets local governmental policy, determines types and levels of service to be provided, hires village employees, establishes village codes and ordinances, and approves the budget and subsequent expenditures for the fiscal year. Each member of the Board–including the President–is elected to a two-year term. To ensure that the Board is always comprised of at least three experienced members, elections for trustee positions are held on an every-other-year basis, with three positions being elected one year and four positions being elected the next. All meetings are open to the public and comply with the state’s open meeting laws (Wis. Stat. § 19.81—19.98). In addition to regular board meetings, the Village also has a number of subcommittees that meet on an as-needed basis to determine a variety of issues related to the operation of the Village and its services. Village Board members, as well as various members of the community, serve on the subcommittees. Meetings are posted and are open to the public. Beverly Hitz is Benton’s Village Clerk / Treasurer. She is responsible for coordinating the day-to-day operations and administrative matters of the Village of Benton. Sonya Silvers serves as the Deputy Village Clerk/Treasurer.